We’d love your help. Let us know what’s wrong with this preview of The Last Convertible by Anton Myrer. To ask other readers questions about The Last Convertible, please sign up. How do I gt to read it? what's the rest of the quote that has "...you can plan your life..." in it? 2014- You can't go home again, or at least not always. I do so love this book, but this time through, the central device struck me as a little shopworn, the ending rushed and annoying from the standpoint that these characters are summing up their lives and they are younger at the end of the book than I am now. But the achingly nostalgic tone, the homage to the music of the protagonist's adolescence, that car, oh, that car... all of that still works for me, and will keep me coming back again and 2014- You can't go home again, or at least not always. I do so love this book, but this time through, the central device struck me as a little shopworn, the ending rushed and annoying from the standpoint that these characters are summing up their lives and they are younger at the end of the book than I am now. But the achingly nostalgic tone, the homage to the music of the protagonist's adolescence, that car, oh, that car... all of that still works for me, and will keep me coming back again and again. I've read by Anton Myrer several times and have thoroughly enjoyed it every time. I've just added it to my all-time favorites list. It tells the story of 5 Harvard men and the women they loved in the carefree years leading up to World War II where their biggest worries where the next dance of the Big Band Sounds of those days would be and who would be driving the huge, beautiful Packard convertible they called The Empress. Their lives are turned "upside down" with the beginning of WWII. It i I've read by Anton Myrer several times and have thoroughly enjoyed it every time. I've just added it to my all-time favorites list. 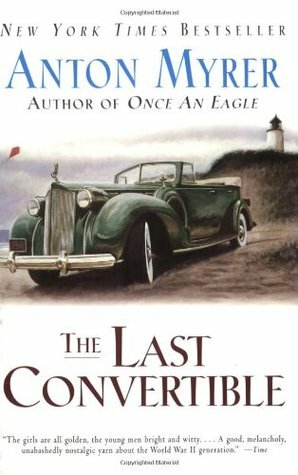 It tells the story of 5 Harvard men and the women they loved in the carefree years leading up to World War II where their biggest worries where the next dance of the Big Band Sounds of those days would be and who would be driving the huge, beautiful Packard convertible they called The Empress. Their lives are turned "upside down" with the beginning of WWII. It is a wonderful tale. Not as razor-sharp as Myrer’s war critique Once an Eagle, but still an interesting look both at the WWII generation and the progression of life from idealistic youth to realistic middle age. It just barely avoids being soapy in places, but is enjoyable from beginning to end. Very good novel. This is a grand sweeping epic that is reminiscent of the style of novels that were big in the 1970's. Nostalgic, soapy, melodramatic stories that seemed to be the norm. This one stands out as one of the best from that period. Tells the story of five friends from Harvard in 1940 and we see how their lives and loves play out through the second world war years and beyond. The novel incorporates wonderful old big band songs into the story which really helps to set the time and place Very good novel. This is a grand sweeping epic that is reminiscent of the style of novels that were big in the 1970's. Nostalgic, soapy, melodramatic stories that seemed to be the norm. This one stands out as one of the best from that period. Tells the story of five friends from Harvard in 1940 and we see how their lives and loves play out through the second world war years and beyond. The novel incorporates wonderful old big band songs into the story which really helps to set the time and places in the novel.I really enjoyed the middle third of this book and I believe it to be the strongest part of the novel. The first third was a bit over the top dialogue wise. All that snobby and pretentious Ivy league crap (Old chum, old chap, old stick, Grog-o, Wog-o, Trog-o sheesh!). I would be surprised if people actually spoke that way. Overall, I enjoyed this novel and I swear if I listened hard enough, I could hear the big band sounds of Glenn Miller in the distance. Anton Myrer creates masterful character development in his novel revolving around Harvard students, WWII and ensuing family years filled with love, grief and personality conflicts. Following the book’s title a classic four door green late 1930’s Packard convertible nicknamed Empress is featured throughout the book providing transportation for dates, football games, Boston’s Back Bay as well as memorable jaunts to Nauset Beach on Cape Cod. This is one of my absolute favorite books... When I wish to be caught up in a time that only existed for a fragile moment in lhe lives of a select group, this is one of the best to capture the experience and anguish of joy, sorrow, love, laughter, and longing all in one. (0ther books that have the same effect for me are The Best of Families by Ellen Berlin, and Circle of Friends by Maeve Binchy.) I think at least one of these is probably due for a re-read soon. I never understood my dad until I read this book. This book so completely makes you feel a part of the whole pre-WWII generation and the music that kept them going despite the great depression. I ADORE this book. One of my all time favourites. I even found a hard copy version in an old bookstore on Cape Cod. Couldn't get more perfect. Such a good story, such good characters, oh how I wanted that car!! And would have taken Dal as well....he was the best. Great book. I laughed and shed a few tears. In the book you follow the lives of 5 Harvard men. You meet them as they are starting there first year of college. They are normal kids. Going to school, having parties and driving to football games. Then their world turns upside down when a little thing called Pearl Harbor happens. The book spans a 30 year time period. You follow them through the war and after. Marriage & kids. It's interesting seeing how things were then. I didn't quite understan Great book. I laughed and shed a few tears. In the book you follow the lives of 5 Harvard men. You meet them as they are starting there first year of college. They are normal kids. Going to school, having parties and driving to football games. Then their world turns upside down when a little thing called Pearl Harbor happens. I wasn't sure in the beginning because I felt it kinda dragged and there were too many characters to follow. But I eventually became invested in them and wanted to know what happened. I read this book for the first time in my early 20s. It was another book in which I saw the TV mini-series version first and then sought out the book later. I loved the mini-series but the book quickly became one of my all-time favorite books. The book captured the innocence and hopes of 4 friends who meet in college, and carries you on their journey through the Ivy League, World War II, the Big Band Era as well as the world of unrequited love. It brings home just how much World War II devastate I read this book for the first time in my early 20s. It was another book in which I saw the TV mini-series version first and then sought out the book later. I loved the mini-series but the book quickly became one of my all-time favorite books. The book captured the innocence and hopes of 4 friends who meet in college, and carries you on their journey through the Ivy League, World War II, the Big Band Era as well as the world of unrequited love. It brings home just how much World War II devastated so many lives, and how it changed and effected the relationships of friends and family. It's a poignant, nostalgic, beautifully written novel that starts with the romanticized time of four young friends who thought they had the whole world ahead of them. The War comes and all their lives are changed; the path ahead for them is never the same. At the center of it all is their friendship and the love of that beautiful green convertible. Growing up of one generation - pursuing their dreams, losing their hopes and at the end being, in one way or another, crushed by the reality. The life is not as glamorous as we all dreamt it. The realism of the book is relevant also nowadays when we are all raised being exceptional, with high expectations, but only some of our dreams might come true. The book shows us to live through the disappointments of life - and accept them. Very relevant still today. Úžasná knížka - hlavně její první dvě třetiny. Ale v závěru, místo aby gradovala, jí začíná docházet dech. Ne snad, že by témata a myšlenky Myrer nedohrál, ale až moc to celé natahuje a navrch se mnohdy točí v kruzích. Což je trochu na škodu. I always resist rating something lower than the average but I just didn't care about most of the characters in this book. Considering it is a character-driven novel and a long one at that, it felt like a failing. I did enjoy all of the WWII passages though. While parts of this book were transcendent - wonderfully written, evocative, heart-warming and heart-wrenching - the other parts dragged it down. Výborný príbeh s výbornými dobovými reáliami (2. svetová vojna, vojna vo Vietname, premeny americkej spoločnosti v týchto dobách)... ľudský a oslovujúci. It's a little bit naive in some parts but so true as a whole book. There is so much to say about this book it's hard to know where to begin. An exceptional coming of age story that gets interrupted by World War II when the 'becoming adult' is cluttered with panic, fear, desperation of wartime, and pure confusion. Are those the things we realize we are dealing with? Sometimes, but then again, sometimes not. A generation that is coming out of the Depression, many of whom have seen their families lose everything, watched their parents' confusion and distress at no There is so much to say about this book it's hard to know where to begin. An exceptional coming of age story that gets interrupted by World War II when the 'becoming adult' is cluttered with panic, fear, desperation of wartime, and pure confusion. Are those the things we realize we are dealing with? Sometimes, but then again, sometimes not. A generation that is coming out of the Depression, many of whom have seen their families lose everything, watched their parents' confusion and distress at not being able to support themselves much less a family, finds the future questionable themselves even though they are trying to believe in it and themselves, feeling they can make it better. But war comes on and their immediate futures are compromised in a serious way. Five Harvard students, some from the elite and some on scholarship, designated roommates, build a friendship that supports their belief in themselves and wherein they can find a small brotherhood that provides a base from which they are able to face the disasters and panic they must conquer during their years on the battlefield, participating in and living in one of the lower rings of hell. They have to learn how to forgive themselves and carry on. Some are better at this than others. Life's changes are perplexing. The things you want, or thought you wanted, take sudden turns and people are hurt and have to grow through those disappointments. Some are able to do this, some are not. Marriage, families, professions --all the things of life that now must be experienced, and this generation of post-war families, raised through the Depression and believing that life must be endured, are now raising families with no intimation that these children are going to question all the platitudes and decisions of their parents. Another war comes along, one that is not clearly explained, one that is not even an American war, and the patriotic enthusiasm takes an abrupt turn. The 'old school' parents are stymied and do not understand how their strong beliefs and understandings of life which they never questioned, can be so poisonous to their children. Swing, big bands, the dancing crowds of the mid-twentieth century, perhaps the one thing that defined them before and after the war, provided scenes for this reader that I remembered, that I missed. But I also understood the frustrations of the newer generation being one of those alive during the war but growing up after the war, teens through the '50s, and I knew that the questions the new generation were asking and forcing adults to think about were ones that needed to be asked. We need to ask those questions again, to question an authority that has gotten out of hand and forgotten what we need to be. This is one of those timeless stories that is relevant whenever you read it. It's the kind of book you reread every few years because you want to think deeply and feel deeply about life and relationships. The story is deftly crafted, the prose beautiful. It reminded me of a Jane Smiley saga... so rich in the details of a time passed but still so pertinent to our current situation..
An unexpected pleasure. Have owned it for several years and was always tentative because I worried it would be to hokey or too sentimental. Those concerns weren't completely unfounded, but the story moves along and the characters are mostly interesting. It's long, but generally rewarding. Out-of-print, so you'll need to track down a used copy. Anton Myrer, who died of leukemia in 1996, was a best-selling author whose themes were America's loss of innocence and the use and abuse of power. He is particularly remembered for The Last Convertible (1978), a summation of the American experience during and after World War II, and for Once an Eagle (1968), which traces the life of a regular Army officer and his family from before World War I to Anton Myrer, who died of leukemia in 1996, was a best-selling author whose themes were America's loss of innocence and the use and abuse of power. He is particularly remembered for The Last Convertible (1978), a summation of the American experience during and after World War II, and for Once an Eagle (1968), which traces the life of a regular Army officer and his family from before World War I to Vietnam. Orville Prescott, in The New York Times wrote of Once an Eagle: "Myrer is a superb story teller....who cares about the narrative and is a master." The Army War College Foundation, which is republishing the novel this year, describes it as "a perceptive study of the profession of arms an a chilling overview of armed conflict... Myrer forces us to smell and feel the battlefield as well as hear and see it." Myrer also wrote Evil Under the Sun (1951); The Big War (1957), of which one critic wrote, "I doubt if it is possible to come much closer... to an American War and Peace"; The Violent Shore, (1962); The Intruder: A Novel of Boston (1965); The Tiger Waits (1973); and A Green Desire (1981). The Library has copies of all eight novels in much-read first editions and, in the case of six of the eight, in leather-bound volumes recently donated by Mrs. Myrer. All who have read Myrer's novels know the strength and passion of his moral vision.